Music Activation - More Than Just Set and Forget! Music Activation – More Than Just Set and Forget! Most lighting effects these days have a small microphone in the rear of the electronics with the capability of running “sound active”. 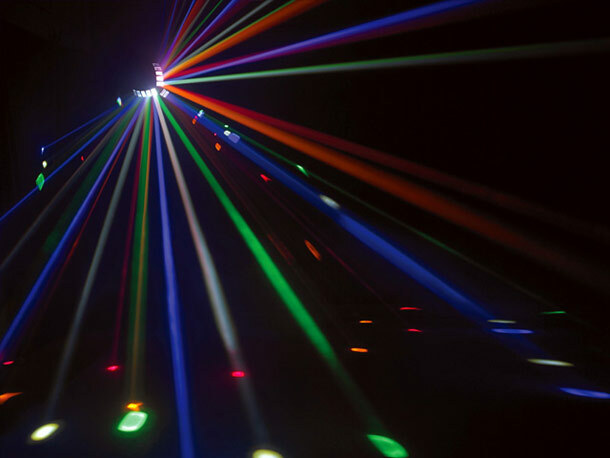 Running your lights sound active is an easy and highly effective way of achieving a pretty sophisticated light show. • Sound active technology has improved, with the development of highly sensitive miniature microphones. • These typically have a dial where you can increase and decrease the sensitivity to suit the volume and beat of the music. • The internal mic is tuned to pick up the sound of the music so it is best to place lights near the music source i.e. the speakers. Isn’t It Pretty Much Set and Forget? Not always.. Combining the right lights is the first step to going sound active. Get a good combination of disco effects, a laser and maybe a centerpiece like a mirror ball. You need to set the DMX address (or flick the switch on the back) of the lights to the ‘sound active’ setting and use the sensitivity dial to make the lights move to your liking. This isn’t rocket science but set too low and the lights won’t move enough, set too high the lights will tend to move erratically, as the mic is overloaded with signal. Note also that the sound active function mainly relies on the bass of the music, not the treble. The microphone reacts to the low frequency sound. So if you have noise restrictions at the venue/event or if you want to achieve the sound active effect without stopping people from being able to hear each other speak, you can lower the treble and/or turn up the bass on the music. This will achieve optimum effect with sound activation without the deafening music playing. The downside of that is that sound activation will not work with certain types of music where bass is not an integral part, for example slow or most classical music will not give you the desired effect because of the lack of bass. • Will do little when no music available, so you’d have to make changes to the lights’ settings if you want them to change colour or stay on one colour only when no music is playing. Our suggestion here is to use separate ambient lights for entranceways and seated areas. Sound active is a simple and visually striking way to achieve a professional looking lighting display. Provided your effects have decent internal patterns they will look the business. If purchasing lights make sure you test in store to a live music source. If they look good at the shop they will look good at your next show. And always make sure you add a fogger to bring your light show to life. Hot Tip: Add a timer-based fogger to enhance the lighting effects. Then you’ll be totally hands-free to DJ or focus your attention on enjoying yourself! Keep Fogging – Tips for keeping your fogger performing at its bestBody language: What’s the message you’re really sending? ?